Inya Baiye J.D. currently serves as the Executive Director for Inclusive Excellence and Strategic Initiatives. She is responsible for faculty recruitment and retention efforts of the Division of Inclusion, Diversity & Equity; diversity education for employees; and strategic communications and marketing. Prior to starting her position at Mizzou in July 2018, Baiye served as the Director of Equal Opportunity, ADA Coordinator, and Title IX Coordinator in the Division of Institutional Equity and Diversity at the University of North Texas. She provided strategic direction for all activities and efforts relating to OFCCP compliance and civil rights, including issues under Title VII, Title IX, Texas anti-discrimination laws, and UNT’s sexual harassment, equal employment opportunity, and retaliation policies. In that role, Baiye had oversight of the adjudication of all sexual misconduct complaints on UNT’s flagship campus, and directed the campus’s efforts to prevent sexual misconduct. 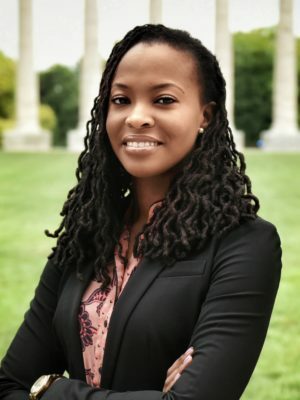 Baiye joined UNT in November 2015, after over four years at Ohio University as the Assistant Director for Civil Rights Compliance, and the Director of Equity and Civil Rights Compliance & Title IX Coordinator. Baiye is a graduate of Messiah College in Mechanicsburg, Pennsylvania, and of the University of Illinois College of Law in Urbana-Champaign.